The SISTERS INC. club is an innovative, not-for-profit club at Hudson Valley Community College, promoting self-sufficiency to job-ready students of limited means by providing business clothing and career defelopment skill. It Provides essential support through a multicultural forum for our diverse student population. The club arranges various social and cultural awareness activities; networking opportunities such as mentoring with professionals in the Capital Region; local and nationally renowned guest speakers; and workshops and seminars. Students from Sister’s Inc. visited New Orleans after hurricane Katrina and were stunned by the hardships of poor families and students as they traveled to devastated areas and schools throughout Louisiana. The mission of Katrina’s is to provide clothing, training and etiquette skills for disadvantaged and underrepresented populations. The goals are to increase the rate of our student’s success in the workplace; motivate women to start on the path to work – particularly students of limited means; and to defuse negative stereotypes about low-income women. Consequently, Katrina’s Closet’s became one of our primary goals in helping individuals to move from economic dependency to self-sufficiency. Community based employment readiness programs help women on assistance develop the skills to perform a job. They fail to address an important problem faced by under-represented populations. The lack of interview attire and approprirate clothing for work. Inadequate personal appearance not only undermines the student’s confidence and positive self-image needed to successfully approach job interview but may also prevent employers from hiring them. The reason for this is that many employers have stated that their appearance does not reflect their company or corporate image. This, in turn, inhibits the motivation to work and become financially independant. Katrina’s Closet was created to fill this gap in career services and to increase the potential for disadvantage population on public assistance to achieve economic independence and self-sufficiency. Clothing is collected primarily through donations. The clothing is organized by size, type, etc. The clothing is stored on the HVCC campus. Eligible students (clients) sign a contract to participate. 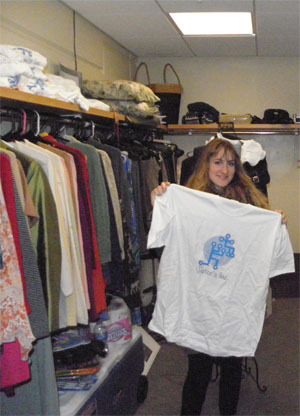 Clients are referred to Katrina’s Closet when they have an interview or are newly employed. Services are provided in a safe setting at Hudson Valley Community College. Office of Career Counseling will be used as primary referral source for our students. Clients receive two outfits for an interview. Once hired, they can return to select additional outfits. Newly employed customers received five outfits. Clients are able to “shop” and leave the store with clothing the same day unless alterations are needed. Based on the need of the populations, interview, make-up artistry, and etiquette seminars will be provided monthly. Web page designed by Mark Garhartt contact at Markg018@gmail.com and Joe Landor. To View another one of my sites check out my first one My first site.